Growing up in New Delhi in 70s and 80s was very ordinary. It was not until the late 80s when the Ram Janm Bhoomi issue surfaced, and insecurities increased, that one realized what seemed an ordinary childhood, was actually une expérience extraordinaire. We lived in a neighborhood where majority of the residents were of other faiths, most of them warm and friendly, with few exceptional ‘communal’ individuals or families.Their prejudiced remarks gave a little break to the usual monotony of goodness, and nothing more. As ambassadors of a ‘good’ Muslim family, we were unknowingly breaking the stereotypes of ‘backward’ Muslims. Our cultural boundaries were unmarked by our parents, thus letting us experience fascinating blend of Ganga Jamuni Tehzeeb. One of the most beautiful examples this blend was Ammi. Though from a Syed family, she grew up in Jaipur amidst Rajputs, and then got married in a Sheikh family of Delhi. She switched from reading Tulsidas’s Ramcharitmanas in Sanskrit to understanding Ghalib’s Farsi poetry with equal ease. Ammi fasted in Ramazan, never missing a prayer, but then would also hop on the adjacent roof top with her friend Meera next door to view the moon through a sieve on Karwa Chauth, declaring that she too had fasted all day, for Papa’s long life. Sharma Auntie who lived nearby did not have any children. 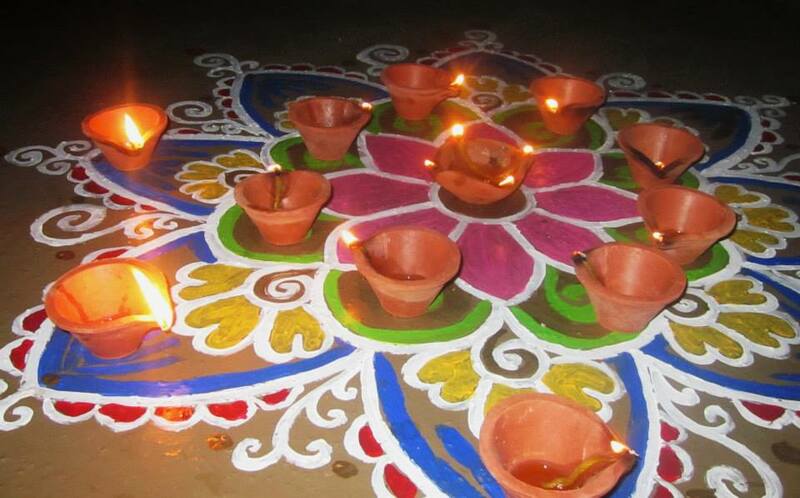 I do not recall how it began, but from early school years till I passed out as a medical graduate, I would go to her house on every Diwali to make a rangoli in her angan. I was referred by her as her ‘susheel beti’ and with tons of prayers “Ishwar tumko hamesha sukhi rakhe”. Sharma Auntie would also make sure that she visited us on Eid with an envelope of Eidi for me. On the day of my wedding, she came early in the morning straight after her Pooja with a shagun( auspicious offering) for my happy married life. And while I was having my Bidai, there were my two mothers crying, Ammi and Sharma Auntie. My in laws who had come from Pakistan were in awe to see we had so many nice Hindu friends. Looking back and reading the news of current spate of violence in India and ban on Muslims in Garba, it is hard to swallow how much have things gone awry. And why? As kids, certainly not to radicalize us, but to familiarize us with our Muslim customs too, we were taken to Dada Abba’s house in Jama Masjid, or to Nani’s home in Jaipur and Agra to witness occaisions like Juma’t Ul Vida, Eid Prayers, Ashura processions and at times even the not so pleasant Qurbani on Baqr Eid. They were as Papa called them, ‘fun and learn’ trips. With the current tussle on social media to ban ‘Shia processions’ in Pakistan I wondered if we ever as kids imagined Moharram as a Shia thing? My Nana Abba and Mamoojans in Jaipur, being prominent family in the community, took out their family Taziya, accompanying the Muharram Juloos all the way to the local Karbala. As the Ashura Juloos passed in front of Nana Abba’s house, there were volunteers waiting with bucketfuls of pink Sherbet to be distributed to them. We stood at the side watching one Taziya pass after another, eagerly waiting for the special ‘Bara Taziya’ and then at the very last the Gold-Silver Taziya donated by Maharaja Sawai Ram Singh of Jaipur. Around mid day would arrive Sattar Bhai, with all his groceries required for the making of Khichra( Haleem)- a complete food with grains, pulses, meat and rich condiments in a deep and wide degh. Maleeda, made out of crumbs of sweet thick rotis was the accompanying dessert. My cousin informed they now make instant maleeda from Sheermal. Since it was Niaz meal, a great care was taken that there was no wastage and no left over food will be thrown away. Similarly Ammi’s extended family in Agra, which was also a prominent Syed Sunni family of the city, not only had their own Taziya but also organized a sabeel: creating a miniature village exhibit quite similar to what we see here in malls in the West during Christmas season. 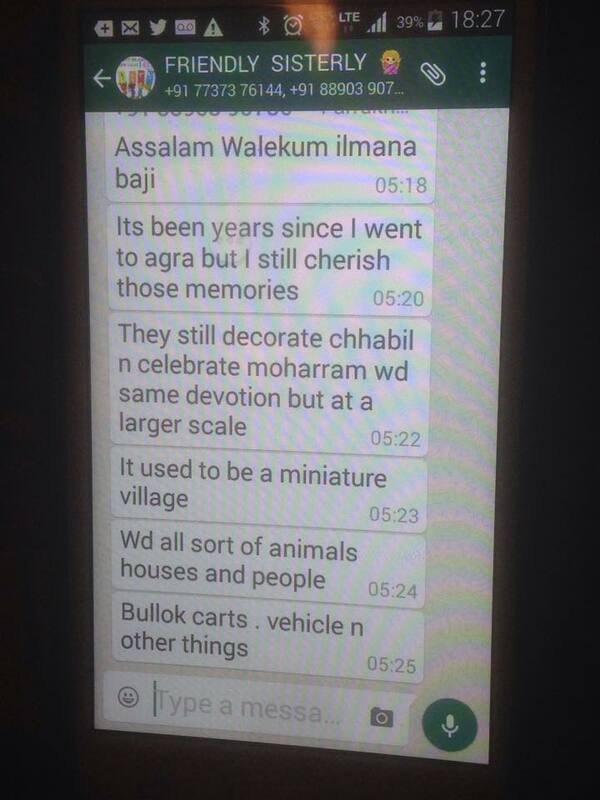 I had faint memories, so I whatsapped a cousin, to find the details. This is how she responded immediately: And as obvious from this conversation, the tradition still continues in many Sunni families. Unfortunately interfaith fences are getting higher, as Ashura Juloos is perceived as ‘Shia’ in Pakistan and Garba has become a ‘Hindu’ event in India. It has become almost impossible for moderate parents to let their children grow and absorb the goodness from each side, and discover on their own that there are no right or wrong faiths and no good or bad cultures. The dilemma of not able to take sides on sentimental grounds, leads one to be judged a RAW agent when supporting India or a Taliban when associated with Pakistan. Equally narrow has become the sectarian outlook, where if you criticize Iranian Theocracy, you are hurled a Yazid slur and if you criticize Saudi extremism, you are a confirmed Islamophobe. The more the religions become tools to play politics, the more these age old traditions will be presumed as exclusive shows of religious supremacy rather than inclusive cultural practices. Things are progressing from bad to worse at a pace never seen before. Human beings certainly don’t appear in a mood for tolerance, what to speak of inclusion. One is left to wonder whether God will salvage the inclusive traditions of Muharram Juloos or Garba Festivals from the bullies of Sectarianism or Nationalism?